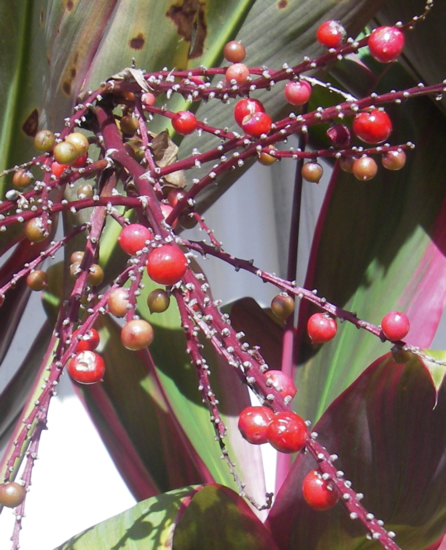 Cordyline fruticosa in Hawaiian Ki may be best known to mainlanders as Ti. Ti, or Ki, is a member of the agave family its scientific name is Cordyline terminalis. 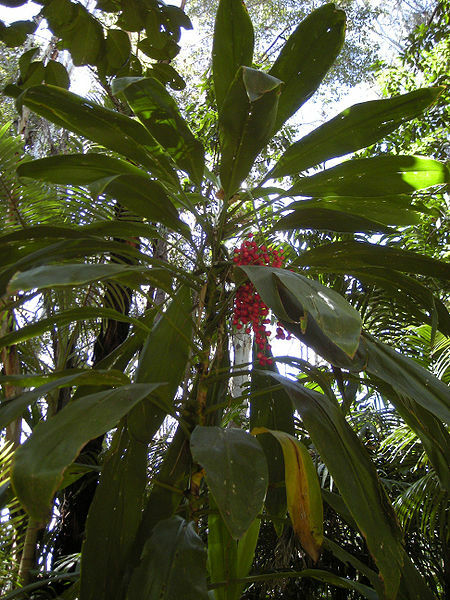 The plant originated in either southeast Asia or Australia. It has a woody base and stalks, and grows from 3 to 12 feet high. The leaves are blade shaped and grow 1 to 2 feet long, in a spiral cluster at the top of each branch. The leaf has a strong central vein. There are several varieties of Ti. The most common is green, but red Ti is found often in Hawaii. Many other colors are found through Polynesia and Micronesia, including yellow, green, black and purple. Ti produces small red or yellow flowers that become red berries. However, it is rarely grown from seeds, but instead propagated from stalks cut from plants. These cuttings can be put directly in the soil, or rooted first in water.